Kobo has been making a lot of changes to their website recently. They’ve also got some of their ebook readers on sale right now. 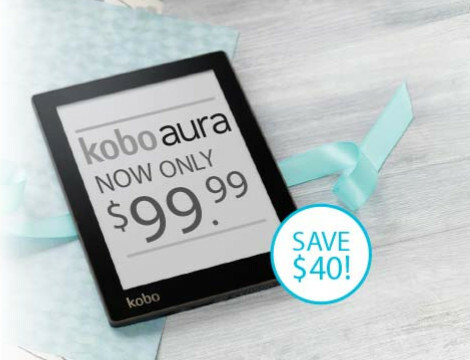 Once again the Kobo Aura is marked down to $99 from $139 both at Kobo.com and Chapters. The Kobo Aura has a high resolution 6-inch E Ink Pearl screen, a frontlight, 4GB of storage space, a microSD card slot, and a flush glass screen with capacitive touch. The device is exceptionally thin (8.1mm) and light at 174 grams. The Kobo Aura HD normally sells for $169, but right now Kobo has it listed as $149 at Kobo. The Aura HD is a 6.8-inch ebook reader with a 1440 x 1080 resolution screen (265 ppi). It has a frontlight, 4GB of storage space, a microSD card slot, and an infrared touchscreen. The Kobo Aura H2O is Kobo’s latest ebook reader, and is an upgrade over the Aura HD. It has a 6.8-inch E Ink Carta display, a frontlight, 4GB of storage, a microSD card slot, and it’s waterproof and dustproof. The Kobo Aura H2O normally sells for $179, but right now it’s on sale via eBay Canada and eBay US for $159. Shipping is free to Canada; to ship to the US it costs like $15, and the price converts to about $139 US, so it’s still a good deal even with shipping added on. Aside from ereader deals, Kobo has also started a new promotion where you can get 3 ebooks for the price of 2. The deal expires today, however, and only included titles from this list. Did the price of the H2o already change from when you posted? It’s back to $179.99 Cd, meaning that with shipping to the US it’s a little over $171, and not much cheaper than the retail price of $179.99. Yeah, it wasn’t on sale for very long. I have been trying to purchase the Kobo Aura directly from Kobo without success. When I called Kobo they told me there were problems with not just me but everybody who orders from them and that they can not ship readers. They suggested I buy from Wal-Mart or Best Buy but of course they do not carry Kobo readers. Nathan, have you heard this from anyone else? Kobo has had problems like that in the past so it’s not surprising, but this is the first I’ve heard recently. I had no problems ordering the H2O from Kobo, but that was a few months ago. Chapters is about the only other place to get Kobo’s devices in the US anymore. I missed it last time around, but the same eBay seller has the Kobo Aura H2o on sale again for the same price. Probably won’t last long. Thankfully I was able to snag one this time!